If what you have in the piggy bank isn't enough to cover your taxes, there are other options. 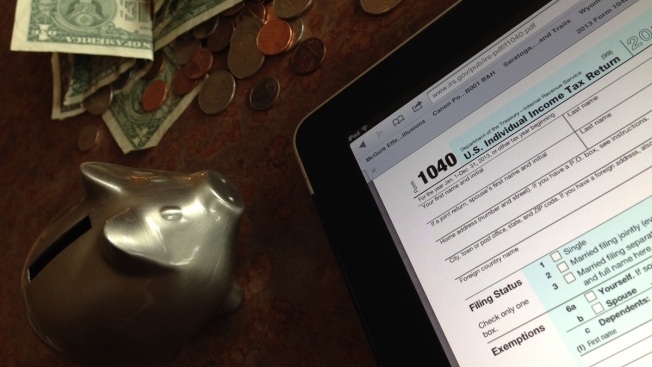 Instead of enjoying a tax refund this year, you are surprised to find that you owe Uncle Sam. Even worse, you do not have the money to pay these surprise taxes. What can you do? One thing you definitely do not want to do is ignore the tax bill. That will only make your situation worse in the long run as you rack up fees and penalties. Make sure that you file your taxes on time and choose one of the following options. Loans/Credit – Depending on the size of the tax bill, it may make sense to take out a loan (if you can qualify) or pay the tax bill via credit card. You will have to estimate when you can expect to pay the bill, and do a cost-benefit analysis on whether the interest you will pay on the credit card or loan is greater than the potential penalties that you would pay the IRS for a delayed or partial payment. Betterment Head of Tax Eric Bronnenkant puts it very succinctly, "Your credit card is usually a high-interest option, but it is an option." Do not forget to include the fees associated with paying taxes by credit card with an approved vendor (generally from 1.87 percent to 2 percent of the total tax bill). "The IRS isn't willing to absorb any interchange fees, like VISA, Mastercard, and American Express fees," warns Bronnenkant. "Let's say they charge 2 percent per round number, so if you use your credit card, you're basically going to have to pay an additional 2 percent to cover the fees." Apply for A Short Extension – You can fill out the Online Payment Agreement application on the IRS website to stretch out your debt repayment over 60 to 120 days, or you can call the IRS directly to make the same request. By contacting the IRS, setting up the extension, and paying what you can before the deadline, you will minimize the penalties and interest that you owe. Before making the final payment, contact the IRS to verify the correct amount of accrued interest, especially if you are paying before the end of the extension. Do not wait on a bill from the IRS. Request Installment Payment – If you need more than 120 days to pay your bill, consider using IRS Form 9465, "Installment Agreement Request" to set up a payment plan. There will be a fee to set up the plan and after that point you will pay the bill in monthly increments that you set up — assuming the IRS approves your plan. Your payment plan must not stretch out the payments for more than three years. Don’t forget that you’ll probably have a few other tax bills to pay in that timeframe. File Form 9465 as early as possible because it may take up to 30 days for the IRS to let you know if it has been approved. Ask For a Hardship Extension – If you qualify for an extension due to financial hardship, you can file Form 1127 with the IRS before the filing deadline to claim an extension of up to six months. Hardship cases require showing a substantial financial loss if the tax is paid on time (for example, having to sell property at a sacrificial loss). A prolonged period of unemployment may qualify. The IRS does not consider a mere inconvenience worthy of a hardship, and you will have to explain why borrowing the money is not a viable option for you. You must supply a statement of assets and liabilities at the end of the previous month prior to filing the form and list all income and expenses for the prior three months. If you have enough advance warning, we suggest contacting the IRS first to see if you are likely to qualify for a hardship situation. In general, your best bet to limit the damage is to contact the IRS before the filing date and pay whatever you can at the regular filing deadline to minimize the damage. Investigate the options above to see which one best fits your situation, and do not ignore the problem. Do not expect the IRS to just go away and leave you alone. It won't happen. "Filing for an extension doesn't get you an extension to pay," warns Bronnenkant. "Let's say you don't pay by April 17th, well then, you're still going to have to pay interest on that money later anyway. Requesting an extension doesn't solve any problems, if your only problem is that you expect to owe money." The 2017 Tax Cuts and Jobs Act and the 2018 Bipartisan Budget Act may cause many changes in your tax situation next season. Try to prevent being caught out by an unexpected tax bill in 2019 by doing your homework on the new laws now.